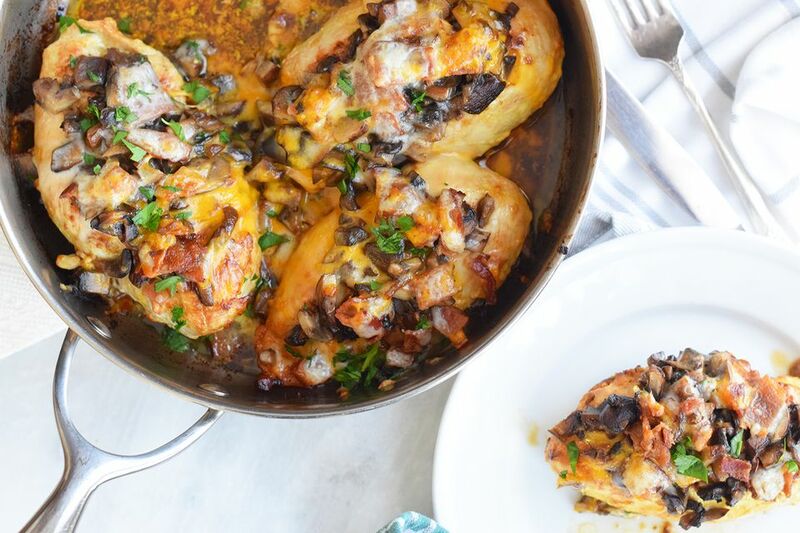 You don't need to go out to Outback Steakhouse to enjoy this delicious copycat of the chain's famous Alice Springs Chicken — you can make it right at home! After marinating, you can get this dish on the table in less than 30 minutes! You only need a few simple ingredients, but the result is super-flavorful and impressive, sure to please adults and kids alike. Use this simple honey mustard marinade on any protein that needs an extra-tasty kick. Make this dish a meal by serving it with mashed potatoes or rice pilaf and freshly sautéed vegetables. Cover the chicken breasts with the honey mustard in a large bowl. Cover with plastic wrap and allow to marinate in the refrigerator for at least 2 hours, and up to over night. Preheat the oven to 400 F. Heat the butter in a sauté pan over medium heat. Add the mushrooms and a pinch of salt, and allow to brown and soften for a few minutes. Stir every minute or so to make sure the mushrooms brown evenly. Remove the mushrooms from the sauté pan and set them aside. Add a tablespoon of olive oil to the pan and bring back up to medium heat. Add the chicken to the pan, making sure to allow the excess marinade to drip off first. Cook for five minutes per side. Do not try to move or turn the chicken before the five minutes is up, to allow for thorough browning. Flip the chicken and brown on the other side. Remove the pan from the heat. The chicken will continue cooking in the oven, so don't worry about the internal temperature yet. Place the mushrooms and chopped bacon over the top of the chicken, then top each with shredded cheese. Cover the pan with an oven-safe lid, transfer to the preheated oven and bake for 15 minutes. Remove the chicken from the oven and test it with a meat thermometer to make sure it has reached an internal temperature of 165 F. Garnish with chopped parsley and serve immediately. You can cook this entire dish in one pan. Don't bother cleaning the pan after cooking the mushrooms. The butter from the mushrooms will add flavor and color to the dish. You can chop the mushrooms more finely before you add them to the top of the chicken or you can leave them sliced. Make your own honey mustard, or use a pre-made version to make your life easier! Just make sure to taste it to make sure you like the way it tastes. Serve a little extra honey mustard on the side, if you wish.